ultraman movies never used cards to call fort Ultraman (I hate this movie) I hope that they go back and make ultraman movies like the good old days .Ultraman 80 and Ultraman Taro would beat this movie.I'm not buying into this movie .Come on and do better IN MAKING ULTRAMAN MOVIES!!!!! PLEASE!!!!!!!!!! 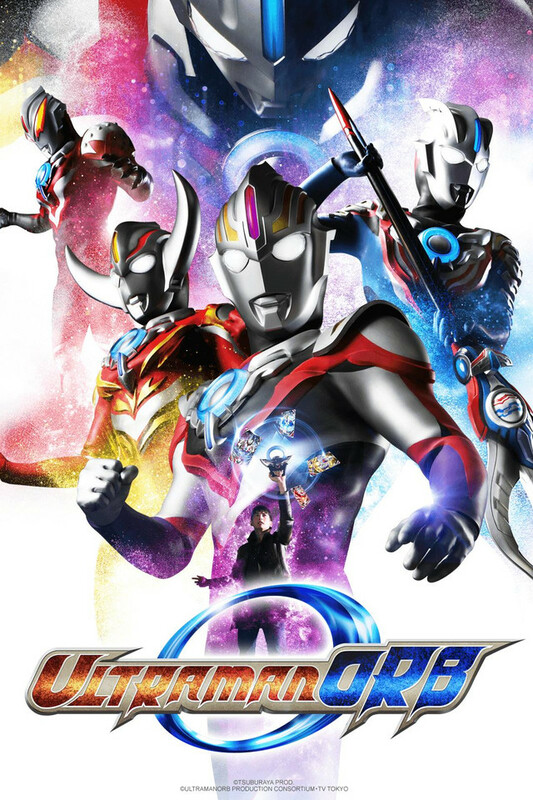 Ultraman Orb is taking the Ultra Series in a new and different direction, while still holding on to its 50-year-old roots. In one episode a very interesting premise has set up, and it is already the most promising tokusatsu of the year. Check it out! This is a really fun introduction to Ultraman! Even after a couple of episodes, the effects are fantastic and the SSP are super fun to watch. I love how the main character is polite and respectful of his previous Ultraman senpai and just chill with everything. The SSP are a fun rag-tag team; and even the villain gives the right amount of mystery and creepiness without making it feel gross. Highly recommend this to newbies and nostalgic people alike. It's an interesting take on the staples of the series. For the big anniversary, Ultraman is giving the viewer a lot of the usual character types but changing how they function dramatically. The show is integrating a fantastic mysterious into the story from the very first story that only keeps building. It's a pretty fun show so far. The characters are quirky and the villain is definitely a mystery. There seems to be some connection between the hero and the villain and some allusions to the hero actually being more of a threat than the villain. It'll be fantastically interesting to see the show play out. As someone who hasn't seen a ton of Ultraman, I really appreciate the craft that goes into it. Obviously not as high budget as a hollywood movie, but it's a TV show and they do great work with what they have. I've been a fan of Ultraman for a while now and I can always tell when a series is going to be great. Orb is one of them. We can already tell that the writers are planting story seeds with good payoffs down the line, and they're connected to Gai's mysterious past. The direction so far is also solid, which is to be expected after Taguchi's work on X. Creative fight scenes with good miniature work is his bread and butter. I'm on-board for Orb and can't wait to see where it goes from here. I love Ultraman and toku! Ultraman Orb is fun so far. I'm so happy to see toku series on Crunchyroll and hope to get more. In the meantime I'll watch Ultraman Orb every week because it's fun, the effects are great and I love the chemistry between the actors. If you're interested in watching this I would recommend watching a few other Ultraman series first, since this is an anniversary series. After the great time that I had with Ultraman X, I wondered how in the world Ultraman Orb was going to match or top it. Three episodes in, it's not only matched it, but it's upped the ante. A lot lighter in comparison, Orb has been some of the most fun I've had with a tokusatsu series this season. It's a fresh spin on the franchise with subtle bits of fanservice/easter eggs, and an ongoing arc that teases you with mysteries the whole way through. Special praise has to go to the effects and miniature work this season as they've more than outdone some of the bigger setpieces of Ultraman X within the first few episodes. As an added bonus, the actual Something Search People website (somethingsearchpeople.com) changes every week with "real-time" footage and all sorts of features which are slowly coming to play in-universe! It's worth checking out when you get the chance! I love tokusatsu superheroes, but haven't watched much Ultraman in the past--this was definitely a pleasant surprise. I love how well this well-shot, CGI-laden show is also 100% unembarrassed to use the classic fake buildings and suits. Hope this leads to more tokusatsu getting legit releases in the U.S., too. Endearing characters and bombastic action make this a win! I've never watched a full Ultraman series before but have seen a number of bits and pieces trough out the years. This year I'm committing to watch the whole series of Orb, as the first three episode have been lots of fun with endearing and comedic characters and some big fight scenes. I'm excited to watch all the different permutations of Ultraman that the mysterious Gai goes through.